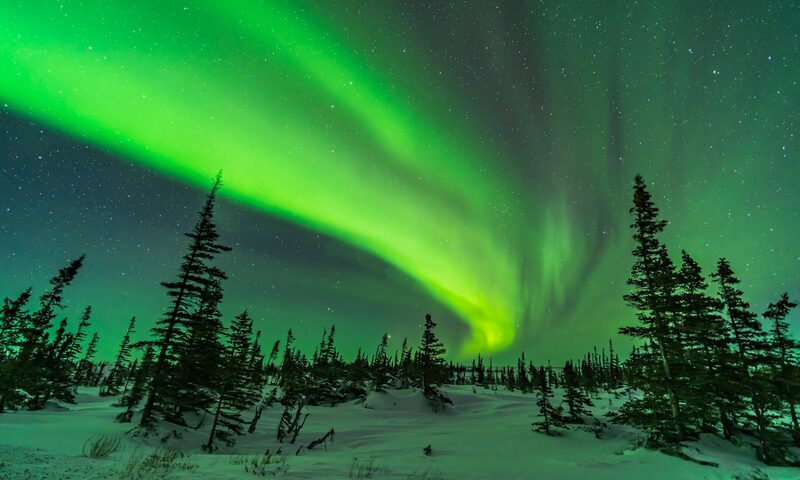 Last night, February 7, the Northern Lights danced for us again, starting with a curtain of green and pink in the south. Our second tour group at the Churchill Northern Studies Centre has been here a couple of days, all under what looked like hopeless cloud. But last night the clouds cleared unexpectedly to reveal a moonlit winter sky. I completed my evening talk all about the Sun and aurora, during which we were monitoring the auroral activity indicators on SpaceWeather.com. Sure enough, about 9:30 pm, right on cue and perfectly timed for convenience, a curtain of light began to dance across the southern sky, appearing in Orion. The gibbous Moon is just off frame to the right. We began the viewing from the Centre’s second floor viewing deck which looks east and southeast. 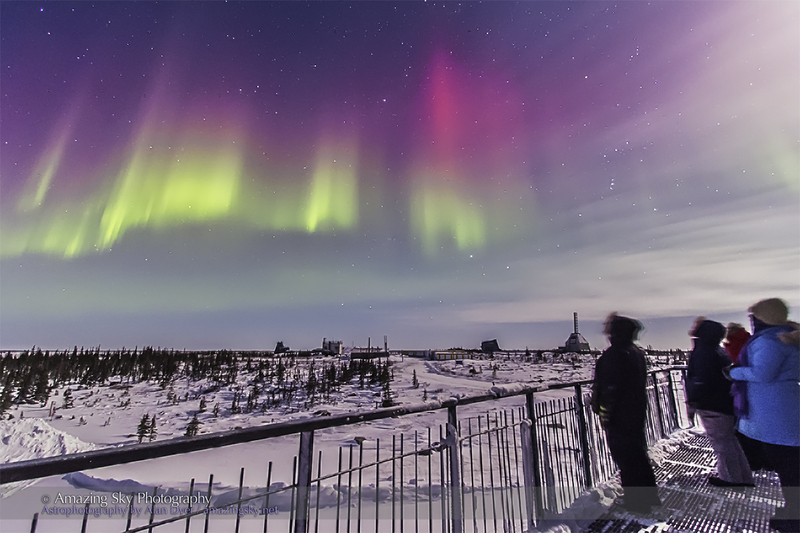 This view shows the auroral curtain over the derelict launch towers of the Churchill Rocket Range. Built in 1957 for the International Geophysical Year, the Rocket Range was in use until the mid-1980s as Canada’s only launch facility. 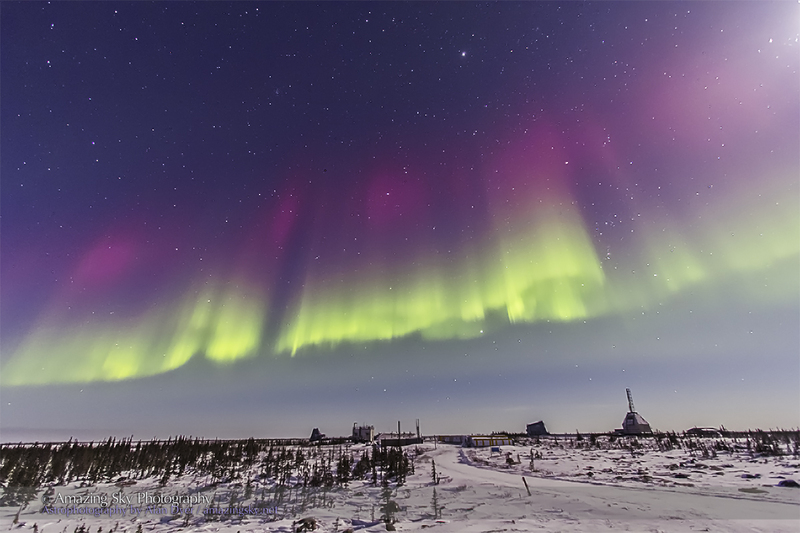 Hundreds of sounding rockets, many of them Canadian-built Black Brants, were launched from here, shooting up into the ionosphere on nights just like this to study the aurora. Orion is at right. 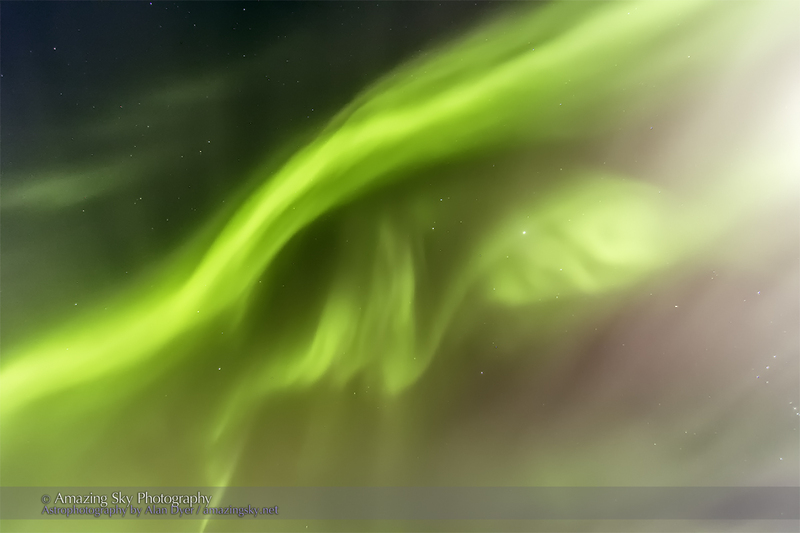 While we saw this curtain in our southern sky, others farther south in Canada were seeing it in their northern sky. The greens were easy to see with the eye but the magentas were visible only by the camera and I have punched up their intensity here. This night, as the aurora display developed it moved north to the zenith, shown here, with the sky also lit by moonlight and with some high haze. But the combination makes for a wonderful abstract swirl of light and colour. Amazing photos of the aurora. In the late 80s I was on a research vessel in the arctic, and I had the experience of seeing an auroral curtain to the south of the ship, over the stern as we motored north. I could not persuade many inside to come our for a look!